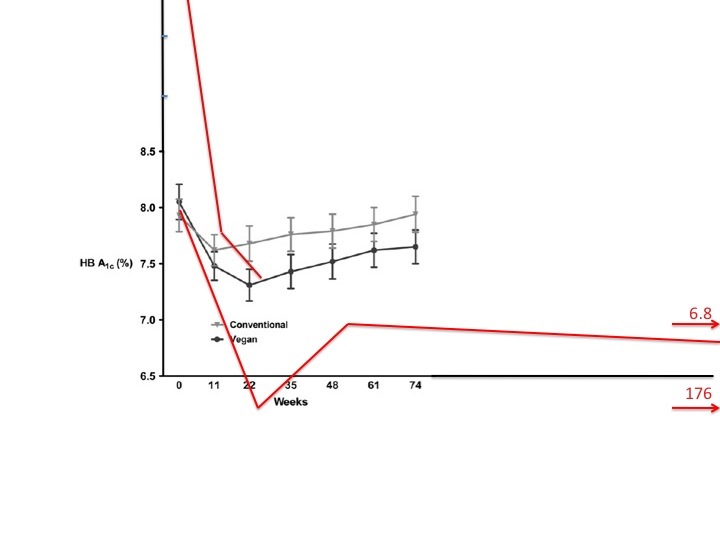 Stan, I think we have to note that weight gain post study was almost a kilo a week (average gain 3.1kg in the first month post study) and three patients were clinically diabetic again by this time (a quarter of the participants). Long term there is no hope for any of them unless they keep themselves so hungry as to have a low carbohydrate intake while ever they eat a "balanced diet". Some might do it, the Iron Few... Most cannot live with this sort of hunger. The fact that the rise in insulin was statistically ns should not blind us to the fact this is a product of small numbers and the routine wide SD in plasma insulin levels. The p < 0.05 fall in FFAs says insulin is physiologically elevated and easily explains the weight gain. House move time again. Glasgow house is sold, time to buy in Norfolk. 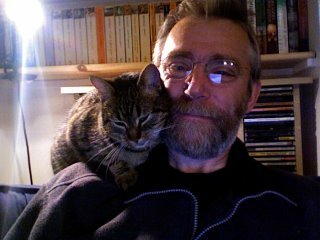 Not sure how much blogging will be happening and we're moving to a non broadband area. Dial-up here we come, but there will be a garden with room for chickens! My immediate reaction is to ask what a type 2 diabetic of initial BMI 23 would look like after eight weeks on 600kcal/d! Dead skinny? Skinny dead? Of course even if the diet was 50% carbohydrate it would only be 66g/d of carbohydrate per day. Some one should tell these folks they can do as well on this level of carbohydrate restriction without all of that nasty hunger if they ate some decent fat and protein along side their carbohydrate restriction. Retired lorry driver Gordon Parmley, from Stocksfield in Northumberland, spent four years on daily medication for type 2 diabetes despite being only 2st overweight. The diet worked and 18 months later he is still free of diabetes and does not have to take any tablets. "It was very tough. I was hungry all the time. It was a starvation diet and food was on your mind all the time," he said. Laura and Elizabeth (thanks for full text) both forwarded links to this study. Low carb diets, in the correct mouse model, delay onset and slow progression of breast cancer. It says the sorts of things you would expect it to say and, if you really feel this highly artificial mouse model has relevance to the sorts of breast cancer humans might develop, it certainly suggests that a low carbohydrate diet might have some benefits. But the paper itself is awful. Two giggles did come out of it. First was the use of high percentage of casein as the sole protein source. Now somewhere, sometime, there was a vegan nut who screamed that casein was carcinogenic. China? China Syndrome? China Study? T. Colon Campbell???? Shrug. These has-been vegans get everywhere. The second is the extreme fat phobia of the authors. I know these people have to make a crust and funding is not what it used to be and fat bashing is always helpful but there eventually comes a point when people really believe that fat causes cancer. Even highly saturated milk fat. You can just imagine that cows evolved casein and palmitic acid to kill their calves. Or humans are not mammals in the same way as cows are, human breasts having evolved to sell newspapers rather than to feed offspring. Human babies should be fed sucrose water with a little soya bean oil added of course. It's a strange world. I have reached the point where I no longer give any credence to high fat diet studies where 30% of the calories are coming from sucrose or the pellets are stained red to signify Crisco. Not so the current authors. Ultimately, while sucrose and trans fats are excellent substances to study when looking at the effects of pushing the profitability of the food industry to its absolute maximum, they have nothing to do with a high fat diet based on Food. Reading through the full text there are so many failures of perception and basic biochemistry that it might be worth a post in the end, but here's a typical blooper. Not only do we have Gourmand rats, we also have mice who need false teeth! Untested ad hoc hypotheses can make you look very stupid. "Although mice on 8% CHO diet had slower growing tumors, they lost weight, weighing, on average, 20% less than mice on 5058 diet (Fig. 1D). This was consistent with the mice eating less than the 5058 group (data not shown), likely because the 8% CHO pellets were significantly harder to chew." Diet 5058 is standard breeding colony crap-in-a-bag with 55% of calories from starch. It appears to be mildly obesogenic compared to 8% of calories from starch... That MUST be because the lower carb diet is too hard to chew. We couldn't be arsed to have a control group offered a harder diet with 55% carbs because we're idiots, as are our scrutineers. Oh, and another giggle: 5058 is described, COMPLETELY incorrectly, as a "Western Diet". It's a starch based, sucrose free, 20% fat, mostly PUFA, trans free diet, remarkably similar to Barnard's idiotic vegan diet for the progression of diabetes in humans. It's standard mouse chow. Where do funding bodies find these people to throw their money at? Eeeh, yer has ter larph. When is a high carbohydrate diet not a high carbohydrate diet? Ask a vegan? 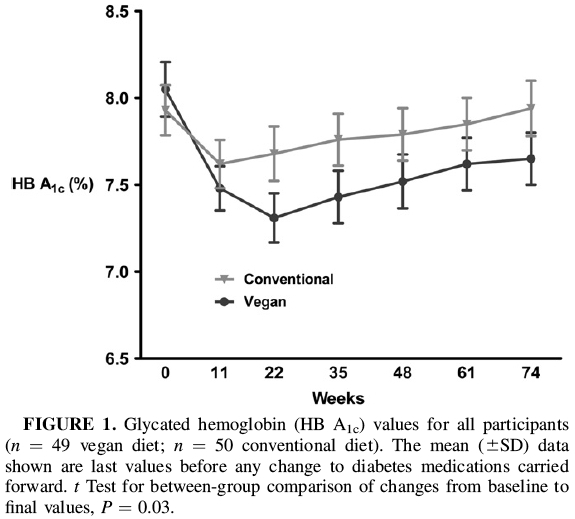 There is a study, headed by Barnard (of PCRM infamy), purported to show the benefits of a low fat vegan diet for the management of type two diabetes in humans. This is, obviously, counter intuitive. So let's have a look. The first thing to say is that it's extremely difficult to extract any hard data from the study. Many of the results are expressed as derived from "intention to treat" analysis. To appreciate quite how difficult this makes any sort of deconstruction, you have to read Dr Eades on this subject. Much of the HbA1c data are presented as the value before any medication change occurred. 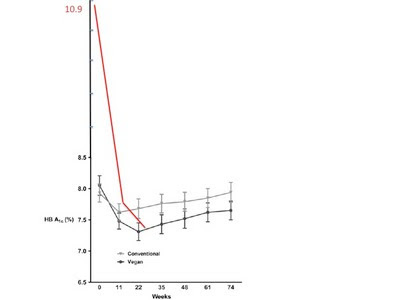 A change could be up or down (both occurred) and could have occurred after one week or after 73 weeks on the diet. The HbA1c value from just before the change in medication gets carried forward throughout the rest of the graph of HbA1c that features in the discussion, see later. But let's take the study at face value. I'll begin with the top section of Table 2. No one sells a diabeso-genic diet for rats based on starch. There are two main techniques for making rats fat and glucose intolerant. The first is sucrose, the second is Crisco. You can also do it with lard, but that's a rat oddity and I doubt it applies to humans, as far as I can see. 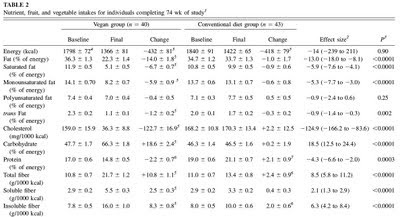 The vegans reduced their caloric intake percentage of trans fats from 2.3% of calories to 1.1% of calories. The ADA dieters didn't. p < 0.0001. If you want to look at either total fructose or HFCS or table sugar intake comparison between the two groups I'm afraid you will have to ask Barnard for this information, it's not in the paper. But I think it's safe to assume the vegan diet included the advice to consume minimal sucrose/HFCS and the ADA, with it's role in promoting diabetes to maintain medication sales, had some. Possibly quite a lot. Who knows? Well of course, as I said, Barnard knows; but he's not saying. Let's just assume p < 0.0001 again. I would want these two factors to be controlled for before I would become interested in looking at food reward effects of the relative diets, important though this might be. You may have noticed that the concept of components described as "a percentage of calories" has already sneaked in. So next we have to look at that % of calories from carbohydrate expressed as a number of grams per day of carbohydrate, especially on that vegan "high carbohydrate" intervention. 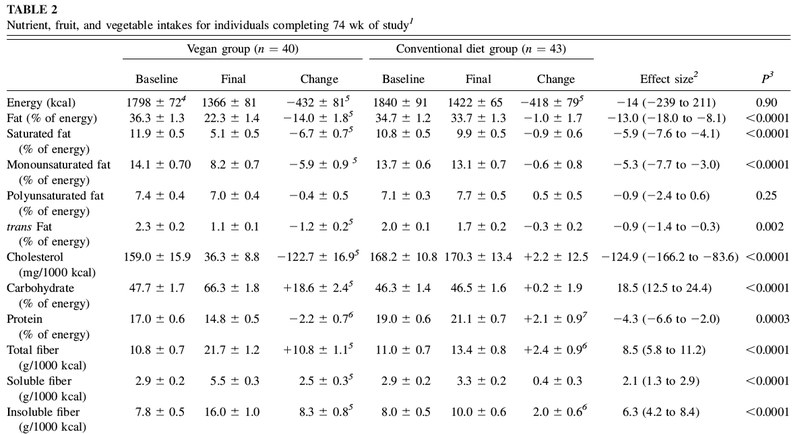 Pre study the vegans were eating 47.7% of 1798kcal as carbohydrate, ie 858kcal or 191g/d. 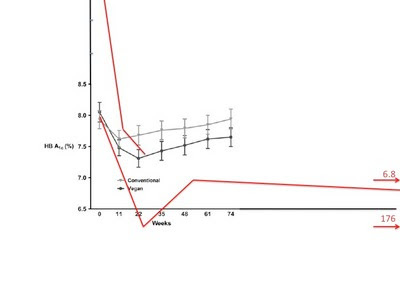 By week 74 of the study they were eating 906kcal/d or 201g/d of carbohydrate (66.3% of 1366kcal). So the total carbohydrate intake increased by 10g/d. Did you notice that on initial browsing of Table 2? Tee hee. Two other factors have to go in. Fibre, included in total carbohydrate, increased from 10.8g/d to 21.7g. Most of this was insoluble fibre, ie it literally became vegan cr*p. You know, wipe, flush... Let's see, 201g-11g=190g! Wow!!! I couldn't have asked for the arithmetic to work out that neatly, just a happy coincidence. Made me laugh anyway. So, is this a high carbohyrdate diet, compared to the SAD? No. NO. Weight loss. For the later months of the study subjects were weight stable. 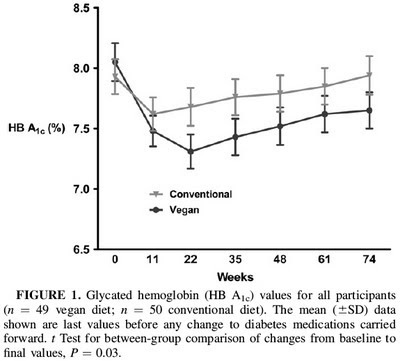 During this phase the vegans and ADA dieters deteriorate at remarkably similar rates. During the initial few months, when both groups demonstrated a very small improvement in HbA1c, there will have been marked weight loss. We don't know what the calorie intake was during this phase. If it was less than 1366kcal per day with a similar % of calories from carbohydrate this might actually have been a carbohydrate restricted diet! it is pretty obvious that the ADA dieters stopped losing weight at 11 weeks and the vegans stopped losing weight at 22wks. End of weight loss is the time at which you would expect HbA1c to stop dropping and metabolic deterioration to set in for both arms of the study. Please note that we have no idea how many patients at a given time point are providing true HbA1c values or how many data points include "carried forward" values before a medication "change". Over 74 weeks 17 vegans actually reduced their meds by an unspecified amount and 10 increased them, again by an unspecified amount. So 17 out of 49 subjects provided "hypothetical" HbA1c values for some unspecified amount of the study period. Go figure. Must have been written by a low fat vegan! 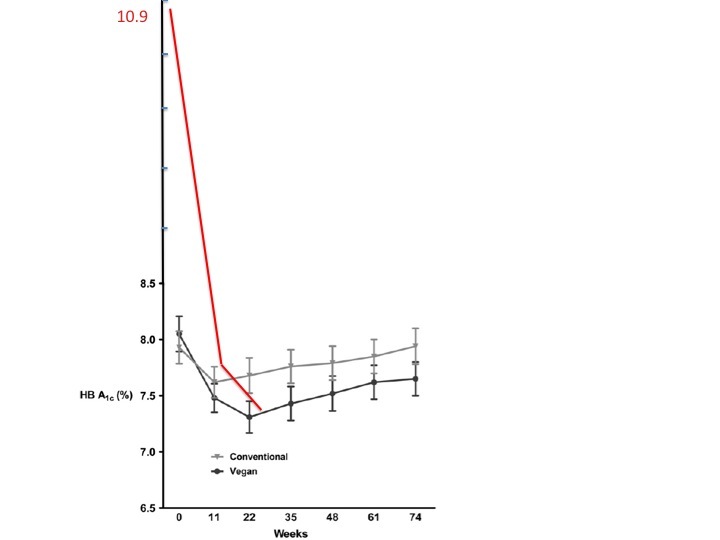 I would be willing to bet that the 17 vegans reducing their meds were all "carried forward" from the first 22 weeks and the 10 increasing their meds were in the >22 week period... You don't generally increase meds in type 2 diabetics during weight loss. You can't lose weight for ever. Once weight loss stops and human adipose tissue consumption ceases we are back to starch for diabetics and progressive HbA1c deterioration. It is quite clear that healthy humans can consume a very wide range of macro nutrient ratios. If you are glucose intolerant you cannot. Are you glucose tolerant? Are you sure? Russian roulette? Dr Haimoto in Japan produced this result by simply restricting carbohydrate to 137g/d of which 14g was fibre. The study was not intended to cause weight loss and it didn't, what there was was non significant. So this improvement in HbA1c is WITHOUT weight loss. Neat hey? Better end-study HbA1c values would need lower total carbohydrate intake. Of course Dr Haimoto gives us all of the individual HbA1c plots and of course the individual weight change data. No intention to treat here, just numbers, including the data from the non compliers. These people were asked to lose weight (not spontaneous). Note that maximum fall in HbA1c was at the time of max weight loss which occurred at the time of maximum compliance, here are the individual weight loss plots. No intention to treat fudge. Carbohydrate limit was recommended to be at 80-90g/d but some carb creep was noted... Despite this, note the downward trend in HbA1c over the years. Sorry there was no room to extend the graph to the full 44 months. Oh, and for chopping off the top of the last graph! Labels: When is a high carbohydrate diet not a high carbohydrate diet? Ask a vegan? Got a brief look around the net this morning. I see Tom Naughton has skipped his meds again. If the enforcement order isn't working it's clearly time to speed up the inclusion of PharmAmorin in his (and everyone else's) tap water supply.